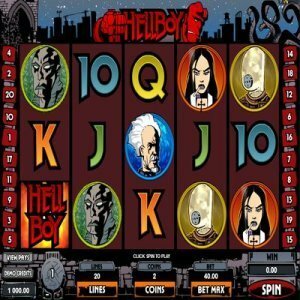 [miau] Online gamers who love the character Hellboy will be thoroughly entertained with this online slot game. Offering multiple bonuses and great graphics, this game will take gamers to hell and back on any device. Players will join in the fight with Hellboy when they take on the mobile online slot game. The graphics of this game are two-dimensional creations. With a red theme, the opening screen shows the playing reels, wager settings, pay line settings, cash out button, spin button, and bank balance. The icons in the graphics include the face of Hellboy and other characters and related images. There are 20 pay lines on this slot game. Each line can have a bet from one cent to 25 cents per line. 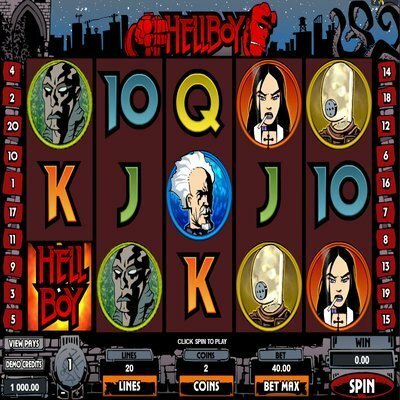 This online slot has five individual reels that have icons of different Hellboy related themes. The minimum amount of lines is one, and the maximum amount is 20 lines. The player who is tough enough to go up against Hellboy and wager a full bet can win a maximum line jackpot of 25,000. The different icons on the reels bring in different amounts of multipliers when landed on the screen. Three in a row from left to right pay out various amounts of points. Each different icon has an individual scale of payouts. The more the wager, the higher the payout. One bonus that players can get is free spins. These spins are not from spinning, but delivered randomly during play. This bonus awards ten free spins. If during these bonus spins the player spins a Hellboy icon, the opportunity arises to hold the wild icons for the rest of the bonus spins. These free spins can result in up to 25,000 credits. Another bonus that the player earns on this game is the scatter bonus. Collect this bonus when the red Stone Fist icon falls on the screen. Two or more of these icons on any of the reels results in multipliers that range from two times the initial bet up to 500 times the amount of wager per line. The wild card feature bonus on this game is the Hellboy logo. It replaces all other symbols with the exception of the scatter feature. This bonus is a four level bonus game. It involves searching for rewards and other team members. Stay away from the blocked tunnels and defeat the monsters here. Choose a door to unlock prizes and team members. Conquer all four levels and the player will receive the Relic of Power. When there is a need, Hellboy will be available to entertain and excite the players of this online slot machine game. Players can take this red, menacing looking, do-gooder with them on any of their devices to play whenever and wherever they desire.